Have your students choose describing adjectives from the different boxes and write them under each object. These adjectives are merely meant as suggestions, and the best thing is if they can come up with suggestions of their own. Also have them write down the name of each object. This can either be used as an individual worksheet, or a basis for a group or class discussion. This downloadable teaching material was created for high school students and elementary school students at Elementary (A1), Pre-intermediate (A2), Intermediate (B1) and Upper-intermediate (B2) level. 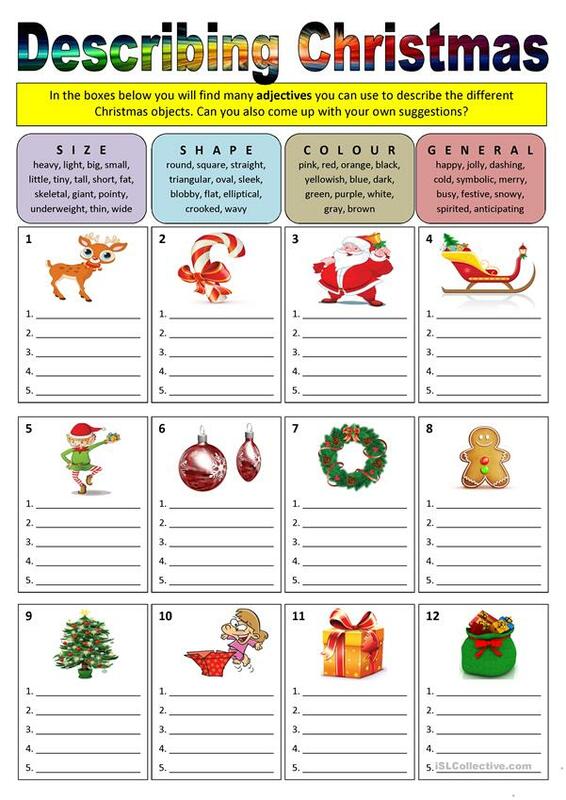 It is a useful material for teaching Adjectives, Adjectives to describe feelings / mood / tone and Adjectives to describe personality and character in English, and is useful for strengthening your class' Listening, Spelling, Speaking, Reading and Writing skills. It is focused on the theme of Christmas. ksfredriksen is from/lives in Norway and has been a member of iSLCollective since 2012-05-23 09:12:57. ksfredriksen last logged in on 2019-04-21 13:07:50, and has shared 65 resources on iSLCollective so far.